If you've ever been to NYC, you'd know about Waffles and dinges. It's a waffle truck started by a Belgian guy. 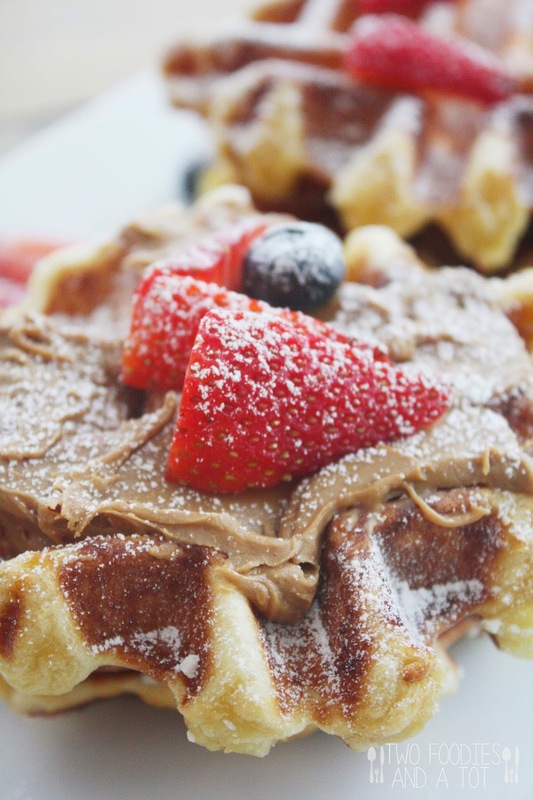 Years ago when I went to Belgium, I totally fell in love with liege waffle. Regular Belgian waffle's totally yummy too but really, it's got nothing on liege waffle in my opinion. And of course NYC has got to have it somewhere! They have a few locations, my usual place was right outside of Bobby Flay's Bar Americain. And when I realized that I can get this beautiful bite of liege waffle right around my block in UES, I was over the moon! They only came to my block once a week though. Sunday morning. It was so convenient. I would go out and wait in line with my "hello, I just rolled out of bed for this goodness" look. Then my tot came in the picture. I used to stroll with him in central park almost everyday and these waffle guys have a cart there. It's not a truck, it's a cart in the park. And it was always a struggle to pass it. Then I would give in. Justifying, I will eat this waffle and jog around the great lawn a couple of loops, it will burn those calories right? Haha. Well..I was obviously dreaming but boy, that was good. And when my tot was old enough to walk with me, we would park the stroller at our favorite picnic spot, sit down and share enjoying nice breeze. That little mouth enjoying every bite of mommy's favorite waffles. Ah...memories. After we moved to suburbia, I guess I haven't looked hard enough but I haven't found liege waffles in any of good breakfast spots. It is not the most common waffles I have to say. So..what do I do? Make them at home! It's actually very simple to make them if you plan ahead. Because this is dough with yeast not batter, it takes some planning. But process is super simple. All you need is a little time. I whip the dough the night before and put it in the fridge. Next morning, take it out, add pearl sugar and let it rest while waffle iron's heating up. Then you're good to go. You can serve it with any of your favorite toppings. I love it with a little Spekloos(cookie butter). SO GOOD! That's how waffle guys serve it too. I always say no to whipped cream for liege waffle because I just don't like it with warm and chewy waffles, but that's just me. Come to think of it, I think have pretty particular preference when it comes to my waffles. Even though I don't take whipped cream for my liege waffle, I like my regular Belgium waffles with whipped cream and thin apple jam. Oh, one thing about pearl sugar. You can usually get them from wholefoods or specialty food stores, if that doesn't work, amazon has them. You'll find Swedish and Belgian. Swedish is a lot finer than Belgian. You're supposed to use Belgian but I happened to have a lot of Swedish at home so until I use it all, I will be using Swedish and it is totally fine. 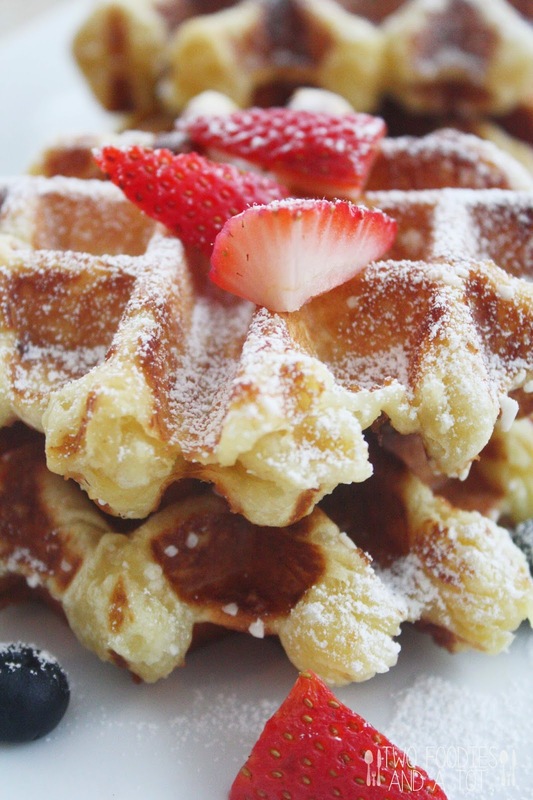 Pearl sugar gets caramelized slightly in the waffle iron and gives a beautiful crunch to the chewy waffle. Because of the caramelization, it even taste fantastic without any topping. 1. Add dry yeast and sugar to warm water. Let it sit for 10-15 minutes. 2. In a bowl of a stand mixer fitted with a dough hook, add flour and salt. Add yeast mixture and start kneading. 3. Add eggs to the mixer one at a time. When all mixed, add butter to it about 2Tbsp at a time, letting it fully incorporated. Batter won't be smooth at this point. 4. You can let it rise in double for about an hour if making right away or just cover it and refrigerate overnight, it will slowly rise. 5. 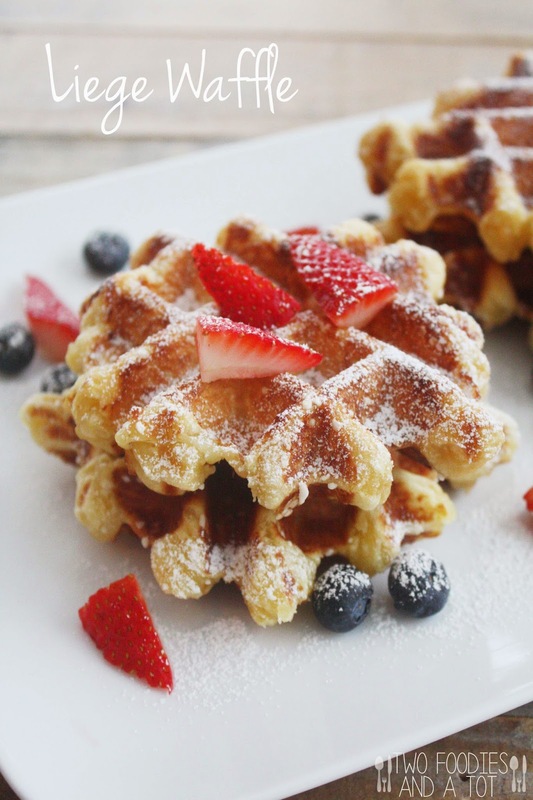 When ready, heat the waffle iron. Meanwhile, mix in pearl sugar to the dough and let it rest for 15 minutes. Using an ice cream scoop, place the dough on the waffle iron and cook.